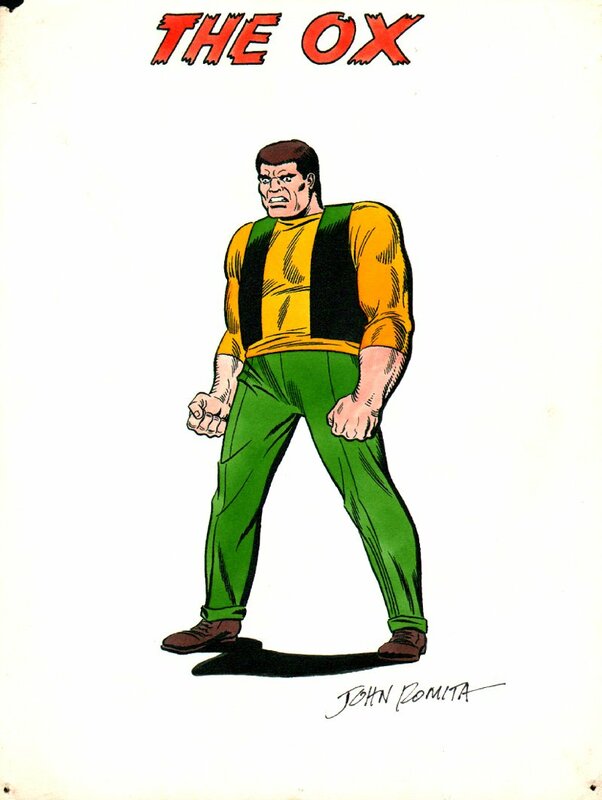 Check out this RARE PUBLISHED Pinup which was penciled and inked by the great John Romita for the 1969 Marvel Mania Fan Club kit! This Pinup features a nice large image of the Amazing Spider-Man and Daredevil Villain from THE ENFORCERS: THE OX! (who first appeared in the comics only 5 years earlier in Amazing Spider-Man #10! Art is drawn on an 8.6 by 11.2 inch art board and is hand colored in very detailed marker! "THE OX" title logo is hand drawn also! The art is signed by the great John Romita at the bottom also! Just a neat "PUBLISHED" Silver Age 1960's Pinup that you just don't see around these days! ALL art on our website (including this one) are able to be purchased with VERY fair time payments, and trades are always considered towards "ANY" art on our website! Just send us an email to mikeburkey@aol.com and we can try to work something out.